Our goal at PMI is to build long term relationships with each of our customers. In doing so, you will always receive the best service in a most courteous manner. We believe in 100% customer satisfaction. This is achieved by providing quality and error- free products at the best total value. Our metalworking machine tools all utilize the latest in user friendly technology ranging from "intelligent digital readouts" for manual machines, to extremely powerful CNC controls with shop floor programming and interactive color graphics. These allow us to meet changing customer demands, all with a high degree of confidence and accuracy. 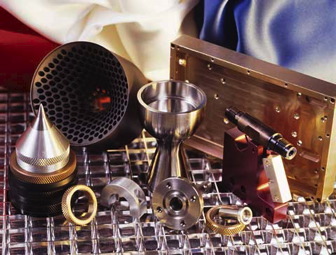 We specialize in Ultra Precision CNC Machining of complex and very close tolerance components that normal machine shops may find difficult, if not impossible to achieve with conventional methods and equipment. A proud member of the National Tooling & Machining Association, Member Organization in good standing of the Houston Chapter of NTMA and of the Society of Manufacturing Engineers.